You can’t put the words iconic and movie star in the same sentence without immediately thinking of the legendary Paul Newman. For nearly six decades, Newman came alive on screen as one of the world’s most recognizable personas. Responsible for many of the great movie characters of all time, Newman had an impeccable way of keeping our attention. A ten time Oscar nominee, and winner for The Color of Money, Newman’s recent death prompts any film fan to ask: what was your favorite Newman? While I am a great admirer of Newman’s, I haven’t nearly seen his entire body of work. So here I present you with the Newman roles that grabbed me. 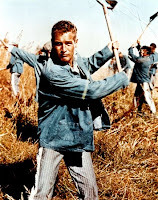 Here’s to the unprecedented Paul Newman. A great introduction to stardom, Newman makes his presence known as an actor with a force to be reckoned with. Many critics consider this his best work. One of my favorite films of all time, Newman’s timeless work as an imprisoned ex-war hero is one of the definitive film performances in the cinema’s history. I can watch this movie over and over, from the fated boxing match with George Kennedy, to the encouraging moment when he leads the other prisoners to pave the road all too quickly, to the egg eating contest; Newman’s Luke has never failed to communicate with audiences. Newman has a great time with his younger co-star Robert Redford in a rousing true story about the famous outlaws. Newman makes his role fun, searing and iconic. Back with his Butch Cassidy director and co-star, Newman and Redford blaze up with screen in this best picture winner. Through all the double crosses, you may not know if you can trust Newman, but you’ll damn sure have a fun time trying. Newman began to accept his aging features when he took the ballsy role of an alcoholic lawyer who finally grows a conscience. Newman uses David Mamet’s pulsating script to deliver one of his best performances. 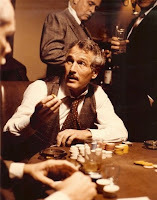 Reprising his Hustler role in Martin Scorsese’s fun pool hall flick, Newman’s performance finally got Newman the Oscar, which most regard as an overdue gift. Regardless, the film is encouraging and entertaining. Fitting surprising well into the Coen brothers’ zany comic family, Newman, as a high-powered industry mogul, showed us his funny side to amusing results. Newman delivered some of his best work as an ailing mafia boss in Sam Mendes’ haunting film. His scenes with Tom Hanks, in particular his last one, proved that the old man still had it. Brilliant actor. Did you know he teamed with actor Robert Redford 3 times? So brilliant. His work with Redford was great.